Two things were achingly clear within the first few minutes of Sunday night’s Oscar telecast. First, there was no question that almost all of America had lost interest in the Oscars. The glaring lack of social media energy towards the Academy Awards, the indifference as most everyone talked about anything else, made it easy to predict the ratings would come in at a record low (and boy, did they ever). Just as obvious was the fact that Oscar has consciously decided to write off Middle America. Excluding us, trashing us, insulting, and marginalizing us was the evident game plan. You see, Hollywood’s situation is very similar to that of the news media. Like the news media, the entertainment business has worked overtime to kill all of its goodwill and credibility with everyday people. And so, and again like the news media, Hollywood has decided it needs to at least hold on to its base — to directly appeal to the hard-left as a means to keep the ratings-bottom from falling out entirely. In other words, although one write-up after another in the far-left entertainment media gushed over the Oscars as being “inclusive” and “diverse,” nothing could be further from the truth. Within ten minutes, the Oscars flipped Middle America the middle finger, told us to go to hell, made it clear that we are not welcome or wanted — unless of course we want to stick around and take the abuse. 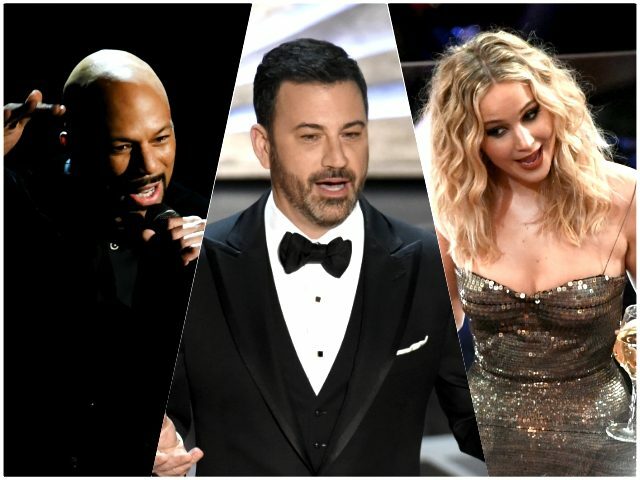 Before the show even began, the Motion Picture Academy told Middle America to pound sand with the selection of the far-left Jimmy Kimmel as host. Kimmel’s personal political beliefs are not an issue. No one cares how he votes. The problem is that Kimmel openly hates us, despises us. He is one of the most partisan and divisive figures in America today, someone proudly hostile to everything we hold dear. Five nights a week, Kimmel makes millions mocking and ridiculing our political and religious beliefs, our values and priorities. More proof of the Academy’s hate for us can be found in the cynical attempt to sucker punch us. Just two days before the telecast, the Oscar producers assured and reassured us that Hollywood’s four-hour celebration of itself would not be political. This was a straight-up lie, because by then they already knew what Kimmel’s opening monologue would look like. This was nothing less than Oscar’s mean girls were trying to set a trap to pour pig blood all over us — pretending to be nice in the hopes of humiliating us. Thankfully, as the ratings prove, we did not fall for it. But we know for a fact that this was the plan. Within minutes we were all smeared as racists and homophobes, openly taunted over the issue of our Second Amendment civil rights. “None other than President Trump called ‘Get Out’ the best first three-quarters of a movie this year,” Kimmel snarked. “We don’t make films like ‘Call Me by Your Name’ for money. We make them to upset Mike Pence,” Kimmel sneered. “If you want to encourage others to join the amazing students at Parkland at their march on the 24th, do that,” Kimmel taunted. There it is — if we support Trump, we are racists. If we support Pence, we are homophobes. And of course we are on the wrong side of the gun issue — according to a bunch of rich and pampered elitists who enjoy something school children are denied: hardened security and armed guards. Throughout the night the hits just kept coming. We took all the cheap shots while the sacred cows on the left remained sacred. Hey, Middle America can take a joke. But we hicks also know the difference between satire and bigotry. When one group is singled out for “satire,” that is actually not satire, that is hostility and hate — which is the exact opposite of inclusion and diversity.